I want your trip to Pomme de Terre to be very enjoyable, why? because I want your return business. We will start the day by casting and then by trolling in the afternoon. If you wish to troll all day, or if you would rather cast, both are fine with me. 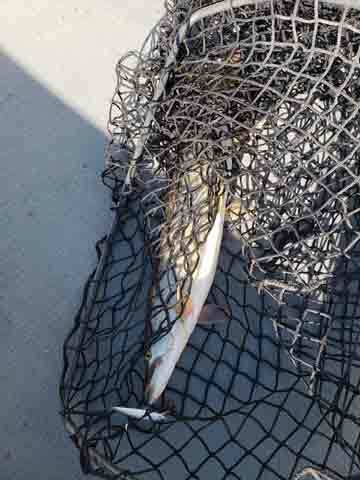 We will do the type of fishing that suits you best. 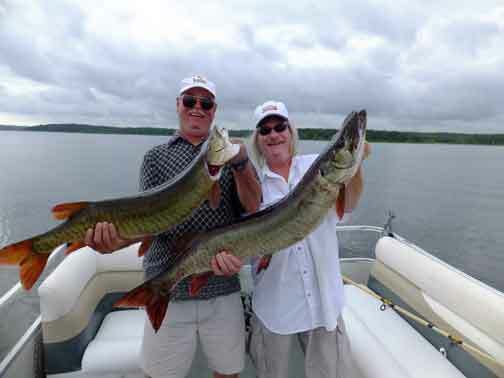 Muskies, like all fish, are unpredictable and if a poor day happens because of the weather or just a bad fishing day we can make arrangements for another trip at a reduced fee. For your day on the water you will need the following equipment: current Missouri fishing license, rain gear (if necessary), beverages (I supply free bottled water) (each boat has a cooler), lunch if you wish to eat or we can stop and get something at a marina (one marina offers call in service for lunches)( time spent for lunch does not count against fishing time), snacks if you wish, make sure you have the appropriate clothing for the time of the year or current weather conditions. You can bring your own fishing equipment, don't have muskie tackle--I do--for you to use, one rule though - lose a lure - you have to replace it, sorry, but those things are very expensive, life jacket, but make sure that you limit the amount of tackle due to space limitations in boats. 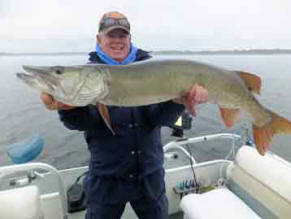 Don’t forget your camera to take that picture of your muskie. I provide a checklist on this website, print it out and use it. If you think of something that should be added let me know I am always trying to improve the service to you and everyone else. No alcohol, while in the boat, please. 1. 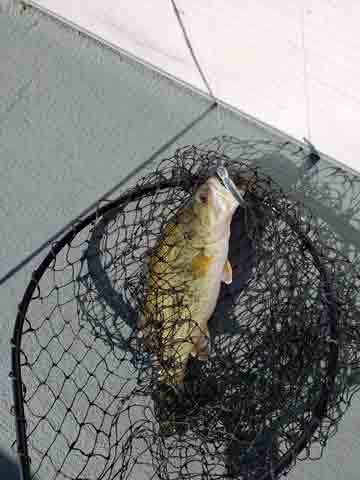 A 21' Charger Bass Boat, very comfortable to fish out of, a very smooth ride on the water. The boat is powered by a 300 HP Johnson engine and has a 74 Lb. of thrust Minn Kota trolling motor. Getting anywhere on the lake in a short amount of time is no problem. 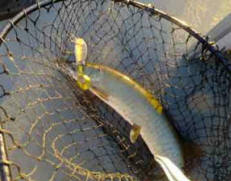 Also in the boat is a Frabil Big Kahuna net to land your muskie. 2. A 24' Pontoon boat if you would just like to troll. Casting is also available from the pontoon depending on the number in the party. On the pontoon there is ample room to get up and move about. There is also some shelter from the sun and the rain if the need is there. On both boats I provide free bottled water, each boat has a cooler for your use. Member of the Executive Board Of Muskies, Inc. 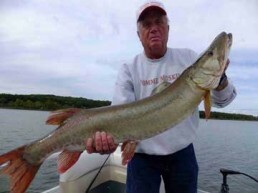 Newsletter Editor for the Pomme de Terre Chapter of Muskies, Inc.
Webmaster for the Pomme de Terre Chapter of Muskies, Inc.